Dimensões desta antevisão: 800 × 571 píxeis. Outras resoluções: 320 × 229 píxeis | 640 × 457 píxeis | 1 024 × 731 píxeis | 1 280 × 914 píxeis | 2 100 × 1 500 píxeis. English: 030502-N-9214D-002 Naval Air Station North Island, San Diego, Calif. (May 2, 2003) -- Sailors aboard USS Abraham Lincoln (CVN-72) man the rails as the ship pulls into NAS North Island to a cheering crowd of family and friends during their port visit to off-load the ship’s Air Wing. 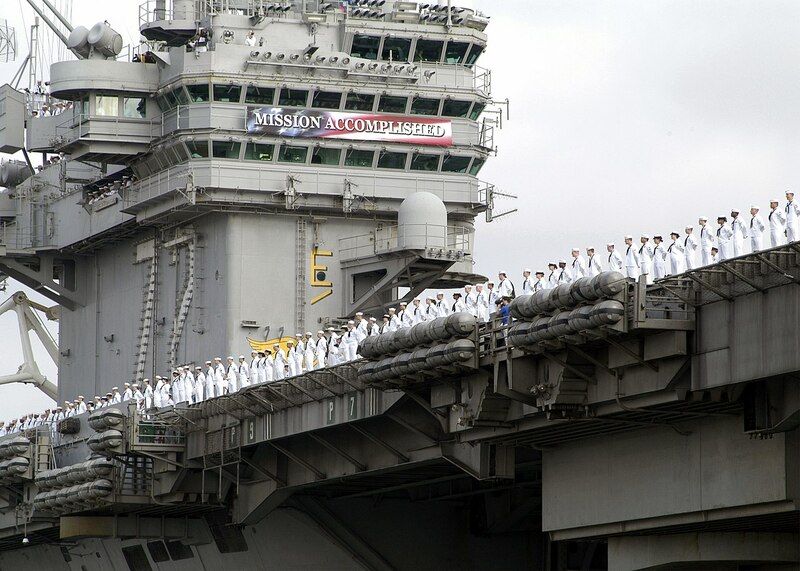 Lincoln and her embarked Carrier Air Wing Fourteen (CVW-14) are returning from a 10-month deployment to the Arabian Gulf in support of Operation Enduring Freedom and Operation Iraqi Freedom. Operation Iraqi Freedom is the multi-national coalition effort to liberate the Iraqi people, eliminate Iraq’s weapons of mass destruction, and end the regime of Saddam Hussein. Esta imagem é uma obra de um marinheiro ou funcionário da Marinha dos E.U.A, tirada ou feita durante o curso de suas funções oficiais. Como uma obra do governo federal dos E.U.A, a imagem é de domínio público.